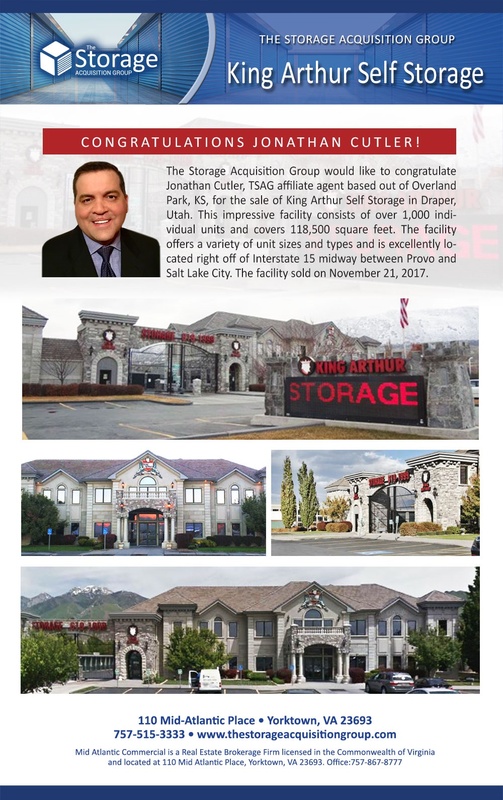 SALT LAKE CITY, November 28, 2017	(Newswire.com) - The Storage Acquisition Group would like to congratulate Jonathan Cutler, TSAG affiliate agent based out of Overland Park, Kansas, for the sale of King Arthur Self Storage in Draper, Utah. This impressive facility consists of over 1,000 individual units and covers 118,500 square feet. The facility offers a variety of unit sizes and types and is excellently located right off of Interstate 15 midway between Provo and Salt Lake City. Mr. Cutler joined The Storage Acquisition Group in 2016 and focuses primarily on the Midwestern and Western United States. This is the second sale of a King Arthur Self Storage facility that Mr. Cutler has brokered within the past three months. The Draper facility sold on Nov. 21, 2017.